You are here: Home / Videos / NetApp Hyper Converged or Hybrid Cloud Infrastructure – What Might The Future Hold? 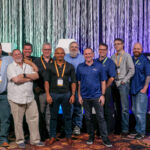 This video is part of the appearance, “NetApp HCI Presentation at Tech Field Day Extra at NetApp Insight 2018“. It was recorded as part of Tech Field Day Extra at NetApp Insight 2018 at 14:00-15:00 on October 23, 2018.